What is the origin of the evil in Sam Mendes production of Richard III? Kevin Spacey plays a Richard that will take its place with the great historical renditions of the role and the citations of Mussolini (strung up by his heels), of Qaddafi in his epaulets are quite clear as is the reference to technology (in this case image creation by way of a large screen TV) as the whipping boy of fascism. Elias Canetti wrote a book called Crowds and Power and the crowds in the Bridge Project's rendition of the play abet the evil. 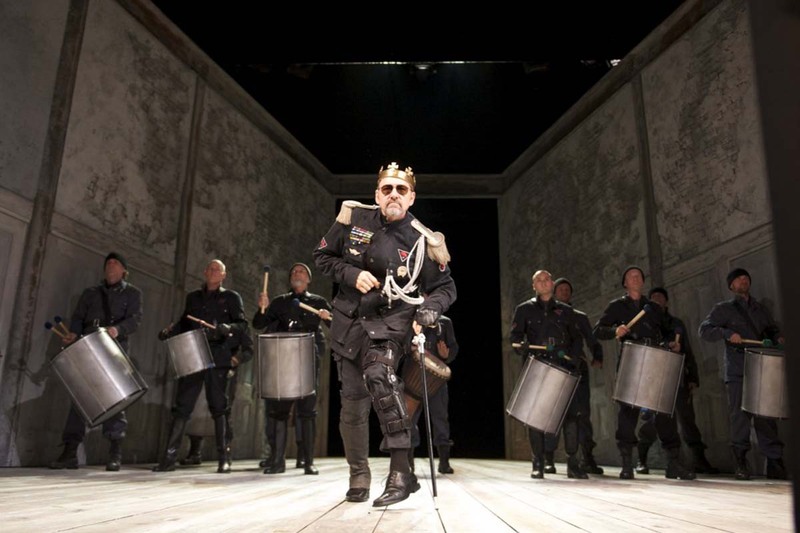 This Richard III is not a modernized Shakespearean production influenced by Jan Kott’s Shakespeare Our Contemporary. Instead Mendes leaves the final chapter of The War of the Roses as a history play that freely partakes of the future. So that besides our latter day tyrants this Richard is firmly anchored in fantasy and science fiction and could easily be subtitled The Empire Strikes Back. The Star Wars analogy is made clear from the beginning in the futuristic typeface used to project the names of characters who dominate individual scenes. The current production parenthetically also makes one ponder the Shakespearean origins of Star Wars (and other similar fare) with its ornate universe of evil and in the end as Spacey finally holds court and the perspective of the stage is deepened, the set does momentarily take on a sci-fi quality. But Mendes, the director of American Beauty in which Spacey also starred, is known for his visual effects and the stage at BAM is transformed into a buffet of visual references to die for including one scene in which Mendes presents the London Underground as Magritte might have imagined it, with bowler hats and yes clouds. Spacey played Keyser Soze in The Usual Suspects, a character who only acts the part of the cripple as a cover up. Spacey’s gnarled Richard isn’t covering up anything and while the malignity is as superhuman as the performance (whose portrayal of gratuitious evil surpasses even the actor’s John Doe character in David Fincher’s Seven), the shock value comes in the recognition of something almost true to life. It consists of turned into lovely scarce something which usually gets results for your needs lacking you will difficult whether experience person modify art once or possibly shelling out a rediculous amount of. The main reason why Document was first for that reason prepared to realize essay or essay writing service. This isn't sole good as well as low-priced.